Attalinātā vadība | KONDICIONIERI PANASONIC | KONDICIONIERIS PANASONIC | "SIA RIKON AC"
Offering the same functions as if you were at home or office: start/stop, mode operation, set temperature, room temperature etc as well as the new, advanced functionality provided by Internet Control to achieve the best comfort and efficiency with the lowest energy consumption. Function shown available for Aquarea and Domestic air to air heat pumps. 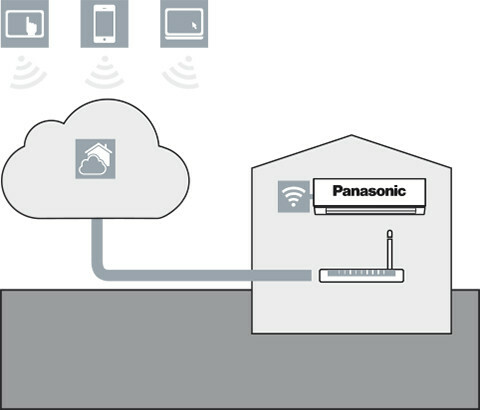 Internet Control is a next generation system providing a user-friendly remote control of air conditioning or heat pump units from everywhere, using a simple Android or iOS smartphone, tablet or PC via internet. Just connect the Internet Control device to the air conditioner or heat pump with the supplied wire and then link it to your WIFI Access point. * Functionalities depend on the license. The information indicated above is subject to changes and updates. Internet Control is underlined with the slogan “Your home in the cloud”, meaning a simple and easy to handle solution has been considered for every user to manage the device, not requiring any communication or computer skills. No servers. No adaptors. No wires. Just a small box is needed to be connected and placed close to the air conditioning indoor unit… and your smartphone, tablet or PC. Your existing WiFi connection does the rest when you are at home. Start the App from your smartphone device, your tablet or your computer, and enjoy a new experience in comfort. And if you are out of home, just launch the App, and manage the air conditioning of your home from the cloud. An intuitive and user-friendly application on the screen of your smartphone or PC that lets you manage the air conditioning unit in the same way you do with the remote controller at home. Internet Control can be downloaded in Apple’s AppStore and Android’s PlayStore. 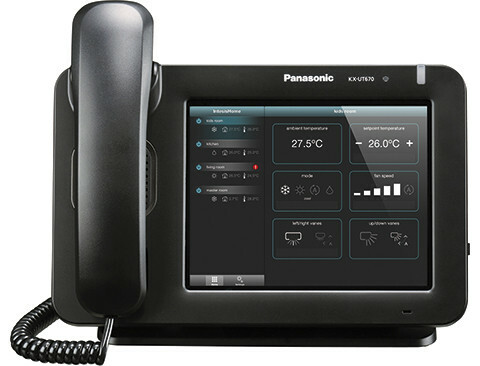 KX-UT670 Smart Desktop Phone from Panasonic (not included). “As an architect, I’m proud of my home. Unfortunately, the pace of my life revolves around airports on all five continents.